My friend Kim made these fabulous cookies for the cookie swap. 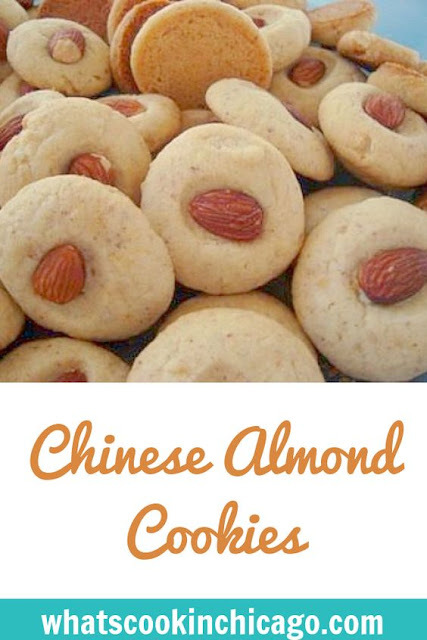 They are way better than any Chinese restaurant's almond cookies and prettier too! Reserve 36 whole almonds; finely chop or grind remainder. Sift flour with baking powder and salt. Thoroughly cream butter with sugar. Stir in all remaining ingredients except whole almonds. Form dough into 36 balls. Place on greased cookie sheets. Press a whole almond into center of each ball. Bake at 350 degrees for 20 minutes or until lightly browned. Makes 3 dozen*. These look great! I've been looking for a recipe to replicate the almond cookies I've eaten growing up. I'm going to have to try this! It looks very ordinary to me, but since I love eating bread with almonds, Let me try that Chinese Almond Cookies, May I just ask, what is something extra ordinary about that recipe?